Advisory Director and Senior Investment Strategist, Goldman Sachs Group, Inc.
Alan Greenspan and Adrian Wooldridge discuss the seismic events and trends that formed America's economic history and the insights that can be derived for today's leaders. COHEN: Gentlemen, are you ready? Excellent. Ladies and gentlemen, welcome. Our apologies for the slightly delayed start. We’re delighted to see you all here this evening. I’m Abby Joseph Cohen, senior investment strategist at Goldman Sachs, and I am truly delighted that this evening at the Council we have authors of a very important new book. I’m sure you have read about our guest speakers. Chairman Greenspan, it’s always an honor to introduce you. I’ve had the privilege previously. And I suspect that you don’t need the introduction. There is also, of course, the bios that are included in the handout materials. Adrian Wooldridge, the other author of tonight’s book to be focused on, is somebody who is not as well known by this group, at least by name, but certainly not because of the body of his work. Adrian has been based in the United States for many years for The Economist, a publication in which bylines are indeed a rarity. However, his work is well known to you. He’s currently the political editor and writes the highly regarded Bagehot column. He’s the author of nine previously published books. And we’re here today to discuss this book, just published this week. I may be one of the few people in the room that actually has a copy, and I’ve read it, and I would strongly encourage all of you to do the same. It is a book that will appeal to all of us geeks in the room who are interested in economic history. But I will also tell you that there are other things to commend the book. It’s extremely well-written. It is an absorbing read. And, oh yes, by the way, there are pictures—(laughter)—which is a little bit unusual for a text on economic history. One of the recurring themes in the book is the role of innovation, productivity growth, and creative destruction in the economic history of the United States. Let me point out that Adrian used to write the Schumpeter column in The Economist, so a lot of this comes naturally to him. As a reminder, the format at CFR events it that we begin with a moderated discussion for about thirty minutes in which I will enjoy the dialogue with our speakers. And this will be followed by thirty minutes of additional questions from all of you. The book begins with the following, and I’m going to quote: “Imagine you are at the World Economic Forum in Davos, Switzerland, but it’s not 2018; it’s 1620.” That’s a great way to start, and gives you an idea of the flavor in which this book is written. Let me add, what was going on in 1620? The Jamestown settlement in Virginia was failing. The Plymouth settlement in Massachusetts was just getting started. And yet, here we are now in the United States of America, the world’s most successful economy ever. So the book tells of the enormous success of the American economy from very humble origins, but it also spares little criticism of failures. And that, to me, was one of the charms in the book itself. I want to put this in some historical perspective, if I may. I’m taking this from the book: “From the birth of Jesus until 1820”—so two hundred years after 1620—“economic growth was eleven percent—not per annum, not per decade; per century.” And think of what it has been since the Industrial Revolution. Clearly, there’s some magic at work. And this book is mainly focused on that magic, particularly from an American perspective. And so I’d like to begin the questions with a little bit of that history. And again I would like to quote from the book: “America’s rise to greatness has been marred by numerous disgraces, and primary among those have been slavery and the mistreatment of Native Americans. Two hundred years after 1620, in the early 19th century, the U.S. economy was actually two separate economies. If you’re thinking about Hamilton versus Jefferson, it was industrial versus agrarian. If you’re thinking geography, it was North versus South. If you’re talking about labor, it was free versus slave.” So we have turned now to the British historian, who of course knows an awful lot about colonial America and the period thereafter, to tell us why this dichotomy occurred, how it played out, and what have been the implications subsequently. WOOLDRIDGE: Well, I mean, why it occurred, essentially, was that the North of the United States was probably the world’s most entrepreneurial society. It was a society characterized by inventors, innovation, a self-help, upwardly-mobile culture, a very high degree of investment in education, and of course industrialization and industrial mills being created very, very early on. The South at exactly the same time is a very backward-looking economy which is based on slavery, essentially. And one of the things that happens in the first half of the 19th century is that these differences become more pronounced. The North becomes more and more entrepreneurial, more and more successful, and more and more of a global innovator. And the South becomes more and more preoccupied by slavery, and it becomes a cotton/slave-based economy. And that’s because of this extraordinary invention of the cotton gin, which massively increases the productivity of cotton. So at the beginning of the 19th century you have a sense that slavery may be a fading force. There are moves to abolish it. Britain abolished the slave trade in 1833/1834. There are moves—Jefferson, I think, stopped the importation of slaves, I think, in 1811. So there’s a sense that slavery is a dying thing. And then the cotton gin comes along, makes it much more productive as an economy. So, in fact, the South focuses more and more on cotton and more and more on slavery. So the number of slaves, the exploitation of slaves, gets worse and worse and worse. You’re sucking people in from all over the country to put them into the cotton production. You’re also extending this cotton production system to Texas, to the new territories. So you have this extraordinary bifurcation of the United States into two ultimately antagonistic economies. COHEN: After the Civil War, as the book points out, the U.S. economy begins to grow in a very dramatic fashion. And, Adrian, the book contains comparisons of the performance of the U.S. since the second half of the 19th century to that of the U.K. The U.K., of course, the home of the Industrial Revolution, the center of the world’s dominant financial system and the world’s leading central bank, ultimately lost its leadership role. Why the different outcomes? WOOLDRIDGE: Well, this is the tragic section of the book, from my point of view—(laughter)—and a rather more optimistic section of the book—but I think what America—what we argue in this book is that America becomes the world’s greatest economic power because it has an unusual tolerance for creative destruction. It allows creation, but it also allows the destruction, which makes creation easier. And America is unusually talented in that, partly because it’s so big, partly because it has an entrepreneurial culture, and partly because it’s—it has a Constitution which guarantees property rights and intellectual property rights and the rest of it. Britain doesn’t embrace creative destruction with anything like the same enthusiasm. It’s much more worried about destruction, much more worried about the quality of the environment or disturbing ancient beautiful villages. It has an elite aristocratic culture. All of which means that people are nervous, people are resistant to the forces of creative destruction. America celebrates two things with full-throated vigor. One is the entrepreneur and the other is the corporation. And Britain is very ambivalent about these. And Britain, if you’re successful, ultimately, what you want to be is a country gentleman. You want to have a big estate and a deferential body of servants and be part of society. In America, ultimately, the greatest thing to be is an entrepreneur, I think, to be a big, successful businessman. So in Britain, you sell out. In America, you just build a bigger and bigger and bigger business. And secondly, we—particularly in the second half of the 19th century, our firms were very amateurishly run and very small. Even if they were successful, they didn’t keep growing. America creates this huge class of giant corporations operating on a continental scale with professional, modern management. So we fail at those two things and we continue to pay the price. So keep up the creative destruction. 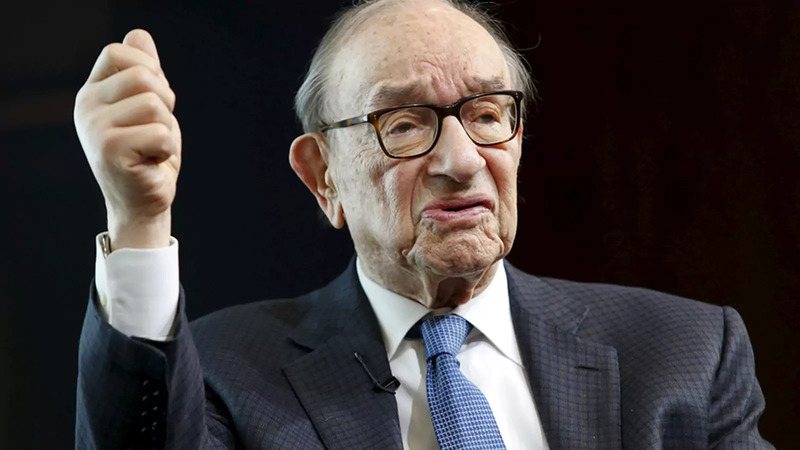 GREENSPAN: Well, let me go back because there’s a—this will create a huge disconnect between what Adrian’s been talking about and what I would like to talk about in general. But I’ll get to your original question. GREENSPAN: What is distinctive about this book is that we state that creative destruction—and hence its most immediate measurement, productivity or output per hour—is the key to determine how standards of living changed over time. And what we did is we took a body of data which is pretty accurate from, say, 1929 to date, and then gets increasingly fog-bound as we go back in time, and indeed there was the usual discussion about from 1840 going back towards the beginnings of the—of the United States, the data are particularly weak. That’s caused by the fact—the way Census data really started and the type of detail that we see in most recent years. But the basic purpose of raising this issue is most histories are qualitative. This is a quantitative history. We have constructed a series of productivity, both multifactor productivity and regular productivity—multifactor productivity, actually, is a proxy for innovation. And so we can separate the innovative part from the physical parts. But we go all the way back in time. And the one thing that we learn very quickly is that if you project, say, productivity from 1929 to current period and then backpedal back, you get close to a level of—a level of standard of living which is belied by data which we see in front of us all the time, like what was the state of civilization in Williamsburg. And what that tells you very quickly is that the rate of growth of productivity must have been much slower in the 18th century and early parts of the 19th century than it is subsequently. That’s a statistical necessity if you grant that we can see what the level of—the level of living qualitatively back in the 1830s, the 1820s, and even before then. But getting to your—having evaded your question for so long as I can—(laughter)—the most interesting aspect that we run into is that if you look in history, we do have data going back on what amounts to the operating rate of the—you know, the non-farm economy. This goes back into the early—basically, I think it’s the official data, 1855. But it goes back qualitatively before then. But if you look at those data and you see an extraordinarily consistent pattern where we’re on the gold standard. And the gold standard is taken as a given like the weather—it’s going to rain or not—back then. So there’s never any discussion whether that’s the right procedure or not the right procedure. But what does show there is that as the economy starts up under the gold standard, remember specie was the basis of all credit. And as you ran the numbers up, you immediately run into the problems of the business cycles didn’t evolve until fairly early on. But the first business cycle was 1819. And if you look at the data, especially as we constructed it consistent with the census data, is the fact that productivity is rising at a fairly good rate. But there’s increasingly the negative part of creative disruption, which is the issue of—which caused the development of labor unions. In other words, in the early part of America there was either owners or craftsmen. Craftsmen considered themselves an upper echelon part of society. And as a consequence, did not want to be characterized in what we subsequently determined was the union movement. So the union movement in the United States did not materialize until quite late in the 19th century. And what the data that we’re looking at show, is that as you got into this whole period of economies going up and then collapsing and the like, and the labor movement evolving, and I would—I would really put the major change as William Jennings Bryan, who made the famous “Cross of Gold” speech in 1896, which was fundamentally a reaction to what prices were doing at the time, which were largely going down for reasons I explain in the book, coming out of the Civil War. But if you basically take that sequence, you begin to realize where the Federal Reserve came from. The Federal Reserve came essentially from the tail end of those consecutive cycles, which was a crisis of 1907. And 1907 was the beginnings of an awareness of how do we get rid—not of smoothing the cycle out, but how do we prevent gold from being the restrictive constraint on growth? Of course, it’s very obvious. But if there were adequate specie going back in the early years when they would have not—the authenticity of the cycle was being generated, that it would have expanded much further. So we get—we get into a point where the labor union and the—I would say, a whole segment of society which was impacted negatively from the negative side of creative disruption begins to follow William Jennings Bryan. Bryan was an extraordinary person in the sense that the Democratic Party, of which he in 1896 won the presidential nomination, was very conservative. He changed it in a way, with the “Cross of Gold” speech, meaning get rid of gold, essentially into a Woodrow Wilson, and ultimately Franklin Roosevelt, and what’s going on since. All I would say is that one of the solutions was the Federal Reserve system. And the Federal Reserve system’s basic purposes were in order to address the problem of specie running out. So what was a—what was done was to set up a new currency, which was essentially the reserves or the value of—or, the value of the total assets on the balance sheet of the Federal Reserve. That is essentially the substitute for gold. We’re substituting the sovereign credit of the United States for gold specie. Gold specie would run out. That would not be the case, obviously, in a central bank which can explain the money supply from the Federal Open Market Committee effectively today. So essentially the really—one of the major points in the history of the United States, especially the financial part, was the elimination of gold as a direct controlling—complete controlling. But remember, that even back then gold was a very prominent issue. The Federal Reserve notes had to be backed by forty percent credit, and another—a lot of requirements that were essentially gold. A goodly part of the book then discusses the implication of this switch in the fundamentals of how the economy is being financed. And we end up, I guess you could say, where we are today, that monetary policy is exactly the same thing it was in 1914. And what was your question? GREENSPAN: I knew I’d get to it. COHEN: Did we learn anything from the mistakes that were made about tariffs and the anti-immigration sentiment of the 1930s? GREENSPAN: Oh, was it 1913? Well, anyway, it was immediately before World War—a World War. And he said—no, this was—no, this was in 1920, I think. Whenever it was. GREENSPAN: It’s correctly—it’s described accurately in the book. (Laughter.) He got up and he said the New Deal was a failure. We had hoped that by a massive amount of spending and debt creation and the like, we would create a new expanding economy. We failed. We never came out of the recession. We tried. We spent money. We created debt. And the issue is that we’re—we have an unemployment rate now where it was in 1931. So he was eventually saying that, no. One of the extraordinary events of American history is the onset of the World War II, which essentially changed everyone’s view—or most of the views of Franklin Roosevelt, who was a superb war president, including his central partnership with Winston Churchill. And if it weren’t for many of the things, some of them of questionable legality, about Roosevelt moving, through lend-lease and other means—a mechanism which finally supported—what’s your country called, Britain? I got it. Anyway. The net result of that was where we are today. And where we are today is we have a monetary system that is basically the Federal Reserve. And if anybody wants to get into detail, I’ll be glad to do that. WOOLDRIDGE: The answer is that we didn’t learn very much, and certainly not enough, because we are repeating so many of those problems, you know, word-for-word almost, with Smoot-Hawley being the classic example of how not to run policy. And we’re—well, you, perhaps, are repeating many of those things in the United States. COHEN: Indeed. Before we open this up to your questions, I have one more for Adrian. Again, Mr. Schumpeter, who was often linked with the expression “creative destruction,” which has been so important in economic history. But there’s a great quote from Schumpeter that basically says: The real engine of economic change is, quote, “people who build something out of nothing.” Basically, the inventors, the people who innovate, the people who have an entrepreneurial idea. And the U.S. has been so driven by this sort of approach. And yet, productivity has decelerated in recent decades. Can you give us some sense of what the underlying economic factors have been over the last twenty years or so that are just not looking as good as they had previously? WOOLDRIDGE: Well, one of the great continuities in American history is that America is extraordinarily good at creating entrepreneurs. And American entrepreneurs are the world’s best in many ways, because they’re the world’s most—greatest megalomaniacs, almost. They see no limits to their ambitions. So in the second half of the 19th century, the economy is completely reorganized by people like Carnegie and Rockefeller, who see that there’s something very dramatically changing in the nature of technology, in the sort of substances—in the development of the steel economy, the development of the oil economy, and in this—the corporation, which they can use to capture economies of scale and scope. They see something there. They seize on it. And they build, you know, the world’s biggest organizations. You know, they are the Napoleons of their time. They’re just thinking on a scale that nobody else in the world is doing. And one of the most remarkable things about the United States is it keeps on producing these titans, these giants. And if you look at the Silicon Valley era in the United States, it’s extraordinary how much it’s a repetition of what happened in the second half of the 19th century. You see people who see that the basic—the material basis of civilization is changing. They see silicon, they see information as the new thing. And they build very quickly empires based upon that. So America has this. And, you know, you think of Jobs, and Gates, and Bezos, who’s, you know, in many ways the Carnegie of our time. So America has this sort of installed base of excellence in producing these people. So it hasn’t lost its basic entrepreneurial skill, it’s genius. But what it has lost is a lot of dynamism. And I think the reason for that doesn’t come from the nature of technology, doesn’t come from the nature of business. It comes from the role of entitlements in driving out productive investment, because they’re badly funded—not properly funded. It comes from the nature of regulations. There are too many regulations and too many ill-thought-out regulations, very bad regulations. And what you see as a result of this is the economy is increasingly mired in slow growth. You can see all sorts of instances. The rate of company creation now is at its slowest pace for about thirty years. The amount of social mobility, both upwards and geographically—and laterally geographically is at its lowest point. The amount of petty regulations that you have is astronomical. Not only your crazy, deranged tax code, but also the fact that I think in 1950 five percent of the jobs had—needed a license. Now, more than thirty percent of jobs need a license. So you’re getting a whole series of whys in which the economy’s being smothered by regulations. And the entitlements also being poorly funded. So our basic argument in this book—there are many historians, such as most distinguished of them Robert Gordon, who say there’s something about a modern, mature economy that means that it can’t grow as fast. Or there’s something about the nature of information technology that means it doesn’t have the same systemic impact on the economy as mass production did or the rise of the railroads did. We reject that. We say that the conceptual speed limits of America’s growth is very, very high. The reason it’s underperforming is because of policy—bad policy decisions. The bad policy over entitlements, the bad policy over regulation, the bad policy over things like the tax code. GREENSPAN: I want to say one sort of a thing about that. One of the—remember that we got into very significant problems, I would guess, in the ’60s, ’70s, and ’80s. And if you wanted some notion as to why there’s something very unusual about the United States, is even though we were declining, there was stagnation in all sorts of negative aspects, we rejuvenated. And what it’s basically consistent with is a notion that there’s something indigenous about the American culture which enabled that to re-sprout after it had a diminished significance for such a protracted number of decades. COHEN: Good. Gentlemen, thank you. I’d like to introduce this opportunity now for our members to ask questions. If you do have a question, please raise your hand, wait for the microphone to come to you, stand, introduce yourself. Please, over here. Q: Thank you for a very interesting discussion. Kathleen McCarthy from the Graduate Center at CUNY. You talked about anti-immigration policies and tariffs as negative factors on economic growth. What is the headline for the world economy today? COHEN: I’m sorry, do you mean the headline with regard to those specific policies, or in general? Q: No. Those are only part of it. What is the headline for the world economy today? GREENSPAN: How would you rephrase that question? Q: Yeah. What is your general outlook for the world economy now? What do you think the big themes are for the world economy? We’ve been talking here about tariffs and immigration policy, but what are the key items for the overall economy globally. GREENSPAN: Well, there’s one thing we do discuss, but not in great detail in the book, is populism. Populism historically is created in economies which are sagging. In other words, the classic case, of course, is Latin American populism. But the best way to construct it in today’s context is that if the—if the gross domestic product is rising at a four or five percent annual rate, there’s great contentment within the society, and there is no really significant move away from the current structure. When you get—for whatever reason—a decline in the rate of growth, say down to two percent or the like, and Britain and Brexit is the obvious example where all of sudden everyone is looking for a way to get out of the control of the European Union, which is a whole another story. But I think that the major issue here is the fact that when you have populism, you get a cry of help—help us somebody—and somebody with a white horse comes barreling in and says, I can do it. And all of populism, which is—remember, populism is not a conceptual framework such as capitalism, socialism, communism. It’s a scream of help—help us, we need somebody, come rescue us—and there are innumerable people who are willing to do that on occasion, most recently being the most obvious period. So I think that there is—structural changes where you can go from what the data on productivity over the generations is showing and the political evolution that occurs as a consequence. One of the most important is in the 1870s when the price level was by statute driven down from the inflated levels of the Civil War back to the pre-Civil War period, and they succeeded. But they created a huge negative response to the consequences of declining prices, and it echoes through to this day. COHEN: Did you want to add something? WOOLDRIDGE: Well, I just—we’ve constructed an actual controlled experiment in the impact on populism in Britain with Brexit, and you can see now, I mean, some serious economic evidence suggesting that Britain’s economy is about two percent smaller than it would have been had Britain not voted to leave the EU. And that’s even before we leave, so that’s going to be a cumulative thing. So the impacts of this populist revolution in terms of slowing growth is already beginning to be evident. And I think the problem is that when populism slows growth, people then demand stronger and more populism, so it’s a self-enforcing cycle. So that’s—I think that’s the big problem with the future: much slower growth than we expected leading to a political reaction, which leads to the creation of policies which make growth even slower. COHEN: Another question, please. Another member? Yes, sir. Q: John Sakowicz, the host and producer of Heroes and Patriots that runs on many NRP affiliate stations. My question has to do with do with unregulated black markets—global black markets. As you know, the notional value of the swaps and derivatives, and structured investment vehicle markets globally is now probably one quadrillion dollars. If you add to that cryptocurrencies and blockchain, you also have another dimension of unregulated markets. Ms. Cohen, you mentioned that Americans are good at creating something out of nothing. A lot of these marketplaces certainly would fall into that category. So my question is what are the risks and opportunities presented by these marketplaces? Again, swaps and derivatives, structured investment vehicles, and cryptocurrencies. GREENSPAN: You’re raising a very interesting question because one of the things we worked on in some detail in the book is fiat currencies versus specie or gold-backed currencies. And what cryptocurrencies are are essentially a fiat currency. Creating something out of nothing is a critical term. If you go back to a revolutionary period when we had that Continental Congress creating a currency which essentially financed George Washington’s military operations, and was—so really a surprisingly large proportion of this currency—remember, Continental currency is also, you know, that currency which isn’t worth a continental. And what happened during that period was very instructive for the future. The first issuance of Continental currencies traded at par for several years, and then, obviously, since it had no backing in gold, it began to deteriorate; that is, the discount factors went—(gestures downward)—more and more. And you get at the end and indeed it was virtually worthless. But what was interesting about that is during the period when it was other than—it was always non-zero. There was no way to get a negative value of a particular Continental currency, so even though it was truly worthless at the end, on average, it actually purchased a goodly part of—certainly of the Revolutionary War and other things. Now the reason this is important is that it’s the first real example that we had in which you could create something out of nothing; that is, over the period of time of the Continental, it may have been worthless at the end, but it actually created purchasing power for certain people. Now, obviously it’s a zero-sum game, so as you go down the loop, there are more losers than winners. But that particular concept of issuing something—it doesn’t matter what it is, if it cannot be negative, if anybody accepts it for any reason whatsoever, it has a value. And so we’re living in a world now which we’ve lived in for a longer period than we realize in which cryptocurrencies—they are indistinguishable. Bitcoin is indistinguishable from a fiat currency of the 1820s or something like that. And this is one of the fascinating problems that exists in finance, is that there is a substantial part of the financial system—because it can be non-negative, it cannot go below zero, that creates temporary seeming values and they work. COHEN: Good. Another question. Yes, please. President Trump has criticized the recent actions of the Federal Reserve. How serious a threat is that to the future independence of the Fed? I think not very—it’s not very. The reason is that the statute of the—that created the Federal Reserve system does specify the fact that governors of the system can be impeached for cause. Now for cause is a very restrictive type of meaning—has a very restrictive meaning, meaning there must be real reasons why you try to get rid of either the chairman of the Federal Reserve or—so the chairman is also a member of the board. So you can’t—there is no evidence that any president has been able to alter Federal Reserve policy even though implicitly a president can get members of the board impeached, but it has always been extremely difficult to raise it, and it has never happened. But there is a very serious problem here which in the end will not matter. In other words, I think the current chairman of the Federal Reserve is a first-rate economist, and I’ve known him for years. And he is going to hear a lot of noise in one ear, and it’s going to just go out the other. And that’s the only way that central bankers can handle presidents of the United States. And this goes back a very long way in history. COHEN: Another question. Yes, sir. COHEN: Can you identify yourself, please? In this arc of economic history that you describe in your book, what role, if any, do you assign to corporate governance and the quality of corporate governance, the consistency of corporate governance, and its impact on the economy as a whole? WOOLDRIDGE: Yes, that’s a fascinating question. I mean, we have two heroes in this book. One is the entrepreneur and the other is the corporation, and it’s remarkable, the role of the corporation in American history. America, in many ways, was founded by corporations; by the Massachusetts Bay Company and the rest of them. America is the first country in the world to make it easy to create companies. Early companies which had the gift of limited liability were very restricted in what they could do. They had to—they got the gift of limited liability in return for building a canal, or building a railroad, or doing something very specific. And what America did was to say, no, you don’t have to do something very specific. You don’t have to go cap in hand to the government. You can do anything. As long as you are a corporation, you can get the gift of limited liability to conduct general business. And as a result of that, it created more companies than anybody else, and it created bigger companies than anybody else much earlier, and that was one of the keys to its productivity growth. And America was also the first country, really, to embrace in a big way the separation between management and ownership, which you see beginning the 1920s. So what I’m saying in a rather long-winded way is that the way we conceive of companies, the way we run companies, the nature of corporate governance is absolutely vital to the success of the economy. So these are really vital questions. They sound very boring, they sound—questions for lawyers and technocrats. They absolutely go to the heart of what makes the economy tick. And so one of things we talk about in this book is—towards the end, one of the reasons that we’re getting a slowdown in growth is that we’ve created very elaborate regulatory systems, rather than relying instead on, for example, forcing financial companies to preserve more equity, which would allow for the people who are taking risks to bear also the consequences of those risks, and also having a regulatory system that focuses much more directly—instead of micromanaging companies—on making sure that you drive out bad behavior, and dishonesty, and fraud, and things like that. So having a regulatory system focused on the right things, giving companies the freedom to operate within the law, but also to conduct themselves within the law is absolutely vital to these things. So corporate governance, not boring at all—really, really important. COHEN: OK. Yes, sir. You’ve been very persistent. Q: OK. Hi, my name is Alex Yergin. My question is back to what makes the U.S. unique. One thing I’ve noticed—I work at a tech company that has offices in the U.S. and in other cities—other countries. There just seems to be a much higher tolerance and acceptance and celebration of failure in this culture. In other countries if you fail you are kind of done. Here it’s great, you can go do lots of things if you fail. If you agree with that premise, what do you think is the root of that? WOOLDRIDGE: I think it goes—it’s deep in the DNA of the country, and it goes back to the fact that this was a country settled by risk takers, that you had people coming here who wanted to practice a different religion from people at home, who were willing to travel three thousand miles, which was a very, very difficult thing in those times, and to start again. So there’s almost a selection process for risk takers. But also, I think the consequences of failure are much smaller in a really big country with lots of space, you know. If your business fails, you can just get up sticks and go somewhere else, whereas as in a much smaller, face-to-face society like Britain, it follows you—failure follows you around. In America, you know, you can go to the West and you see all these ghost towns, you know. People just happily—business fails, I’ll move on, try something else. So a preselection of entrepreneurial types and an ability to get up and move. But it’s definitely a massive difference between, say, America and Germany. Yes, sir, on the aisle. Q: Thank you very much. Max Belmont with First Eagle. Thank you for a thoughtful discussion here to the panelists. Chairman Greenspan, I’d be very curious to know, early in your career you seemed to be very constructive on gold. With the nomination to the Fed, you became—the pendulum seemed to have swung to the other side. Why was that, and where do you stand today on gold? Q: On gold. Gold—so it seemed like, through papers—reading papers from early in your career that you were actually constructive on gold—your views on gold were constructive. GREENSPAN: Oh, you mean my writings before I went to the Fed. GREENSPAN: That’s correct, and one of the reasons basically is history; that is, the period—if you wish to have stable prices for goods and services, which is of very significant economic value, but what the data tell us as going back as far as we can, and well before 1717, which is when Sir Isaac Newton fixed the price of the dollar—then it was sterling, but the equivalent didn’t change as we got into 1789—fixed the price of gold at $4.80 per pound, and that price defined as the price per ounce of gold, if you were to chart goods and services prices and the price of this synthetic price of gold, you find that the price of goods and services in terms of ounces of gold has been extraordinarily flat going as far back as our data create. And this means that there’s an inherent stability—why it is, I mean, people—I don’t want to get into the issue of going back to ancient times—but gold has always been of value, and the question is why. No one has ever satisfactorily defined that question—the answer to that question. And so I think that there’s a very interesting argument that if stable prices is a value, then you would go back to the gold standard. But the evidence suggests that, given human nature and how we respond, that the current procedure at the Federal Open Market Committee, which is the substitute for gold, remember, that particular period—well, in fact to go back to 1914, we increasingly became aware of the fact that the political system was such that it was forcing inflation rather than deflation. Deflation has always been considered far more negative than inflation. That raises another technical argument whether it’s true, but that it is accepted politically is unquestioned, so that the—it’s reflected in the fact that current Federal Reserve policy is not to zero price level, but to plus-two percent. And the question is why? And we don’t discuss that at all in the book, but it’s an interesting issue. COHEN: But we do discuss Sir Isaac Newton.